While all has been quiet regarding HFZ Capital Group’s office tower in Nomad since December, new documents from the Department of Buildings documents filed on Tuesday reveal the project is still on track. CityRealty uncovered a ZD-1 zoning diagram online with a site plan, section, and axonometric drawing that mirror renderings released last year. 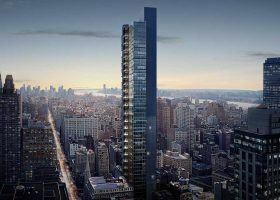 Designed by Bjarke Ingels Group, the tower will rise from a through-block property at 3-7 West 29th Street. Plans for the Bancroft Building have been ultra-hush with much speculation swirling around the design that would ultimately replace the recently demolished, and much beloved, landmark building. But now, the NY Post has the first official rendering of the luxury condo tower that could rise in place of the historic structure located on a block-through site between West 29th and West 30th streets. Though 6sqft was previously told by reps of the development that the rendering seen here was in no way an affiliated project, the two designs do remain visually similar.